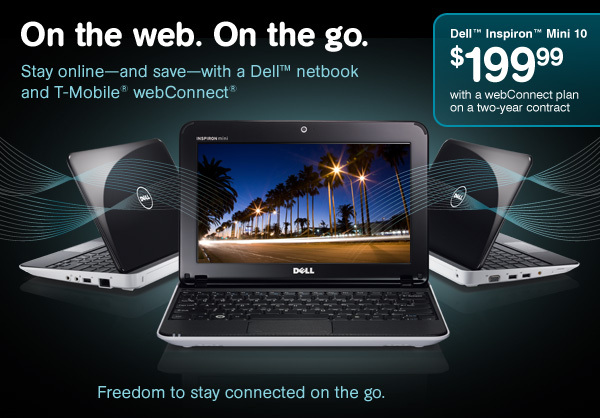 The Dell Inspiron Mini 10 Netbook with T-Mobile webConnect gets you online at 3G mobile broadband speeds, at your convenience, at a great price. Enjoy the freedom of staying connected, get things done and have fun on the go. Well, it looks T-Mobile has jumped on the 3G netbook wagon. Since I already have a data plan for my G1, why can't I use that T-Mo? 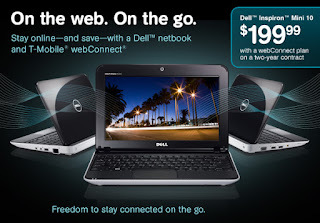 Better yet, since I already have a Dell mini-10, how about free internet since you also offer a free card? And really? 200MB? That is not enough data for the type of person (OK, me) who would use this plan. Claritin D (Loratadine and Pseudoephedrine) Drug Information: Uses, Side Effects, Drug Interactions and Warnings at RxList: "Psychiatric: Aggressive reaction, agitation, anxiety, apathy, confusion, decreased libido, depression, emotional lability, euphoria, impaired concentration, irritability, paroniria." Agitation, anxiety, paranoia ... and just plain over-tired possibly. My daughter has allergies and I just moved. Somewhere around here I have children's liquid Claritin, but I couldn't find it. Triaminic Cough and Cold works well for her allergies too but she didn't want to knock out right after dinner (I should have listened to my first instinct)... so I gave her one tab of her brother's generic Claritin (Equate brand from Wal-Mart). Whoa. I don't think I will do that again. She had dinner within an hour of taking it, then bath, and somehow between "wash your hair and if you're itching from grass wash your body again" and "I'll be with you as soon as I'm done with your cousins" (about 5 minutes) she had a total and complete emotional breakdown about how she is horrible to her dog and not worthy to have a dog-walking business and that Buddy won't love her when he comes back to live with me (I adopted him, but he adopted her) and it lasted *TWO* hours!!! Now, sometimes my daughter, like any woman, just needs to cry and any excuse will do. But this was beyond that. This was me saying it was OK for her to keep him if she wanted and if not, I was happy to take him back (that's a whole 'nother story that I will tell later), but my reasoning and her acceptance of it did not make it ok. It was nerve-wracking!!! Never again. I will stock up on the Benadryl melt-aways . Hyped up I can deal with. Emotional breakdown, no thanks! Josh is running a half-marathon to raise funds for his Haiti trip this summer. He's going with Pulse Ministries in order to bring hope and help rebuild a community devastated by a 7.0 earthquake. The youth group cannot meet this goal on their own and are asking our friends, family, and community to help get them to Haiti. There is more information about the half-marathon on their facebook page.